They say it takes ten thousand hours to become a true ‘expert’ in a particular field, which equates to roughly 416 full 24 hour days, well over a year. Do I buy into that concept? Not necessarily, but what I can tell you is that far more than ten thousand hours have been devoted to the study of the Cash-Landrum incident, and we’re no closer to any final answer on this particular topic. I thought it might be worth taking a closer look at the facts of the case and perhaps shedding some more light on what is widely considered to be one of the ‘Top 10’ CE2 UFO cases on record. For those of you who have not heard of this incident I’ll give you a brief overview, but there are plenty of resources on the web to read further details about this event. On the evening of December 29, 1980, Betty Cash, Vickie Landrum and Colby Landrum (Vickie’s 7 year old grandson) were driving home to Dayton, Texas in Betty’s car after eating dinner at a restaurant. At around 9:00 PM, while driving on FM 1485 through dense pine woods the witnesses said they observed a bright light above the treetops. They initially thought the light was an aircraft approaching Houston Intercontinental Airport (now Bush Intercontinental, approximately 36 miles away) and didn’t pay much attention to it. A few minutes later on a bend in the road the witnesses saw the same light as they noticed previously, but it was much closer and extremely bright as if the sky itself was on fire. The light, they claimed, emanated from a diamond-shaped object about the size of a water tower which hovered just below treetop level. The base of the craft, which was notched off just like the top, was “belching flames and emitting significant heat.” Betty stopped the car to avoid the flames, but the car interior became hot, and they were forced outside where the heat from the object burned their skin. The witnesses, who could feel a burning sensation on their faces, were absolutely terrified and questioned what they were seeing, Vickie was convinced it was the second coming of Christ as she had no belief or interest in extraterrestrials. Betty stepped out of the vehicle to get a closer look, apparently unaware–and unafraid–of the ultimate consequences of her decision. Vickie partially exited the passenger side but had to contend with a terrified Colby who tried wrestling her back into the car. Though it was intensely bright, the object appeared to be dark and metallic with small blue lights visible around it’s middle. Periodically, flames flared out of the bottom accompanied by a “whooshing” sound. Each time the object rose a few feet, only to settle back toward the road when the flames momentarily ceased. Had the UFO not come to rest over the road the cone of fire from its lowest point would have set the forest on fire. Betty later reported that the object also emitted an intermittent bleeping sound, a little known detail of the case. As the UFO ascended and cleared the treeline, Colby counted 23 helicopters converging on the craft, some with military markings, some without markings at all. They would later identify them as twin-rotor CH-47 Chinooks used by the US Army, Marines and Air Force. Betty recalled that “They seemed to rush in from all directions…it seemed like they were trying to encircle the thing.” Within a few seconds the UFO had disappeared behind the trees lining the road. Even though it was a cold winter evening in Texas, the surface of the car was soon too hot to even touch. It was then that they realized how hot the interior of the car had become. They switched off the heater and put on the air conditioner instead. This was just the beginning of a months-long ordeal for the trio. Within a matter of hours they were experiencing symptoms of acute radiation sickness; headaches, sunburn, blisters behind their eyelids, nausea, vomiting and diarrhea. Betty, being the only one who stepped out of the vehicle for any period of time, had the worst symptoms. Over the next few hours Betty’s skin turned red as if badly sun burned. Her neck swelled and blisters erupted and broke on her face, scalp and eyelids. She started to vomit and continued to do so through out the night. By morning she was almost in a coma. Betty’s condition continued to deteriorate and three days later she was admitted to hospital. The burns and swelling altered Betty’s appearance so radically that a friend who came to visit her in the hospital did not recognize her. Her hair began to fall out and her eyes became so swollen that she was unable to see for a week. Vickie had lost about 30 per cent of her hair, and had large bald patches on her head. When it grew back it was of a different texture. Colby lost only a small patch of hair on the crown of his head, this too grew back in time. Betty’s injuries seemed even worse. She experienced a severe sun burn like condition and developed large water blisters, some as large as golf balls, over her face head and neck. One of these covered her right eyelid and extended across her right temple. She also developed a long term aversion to warm water, sunshine or other heat sources. In the year following the encounter she has spent five periods in hospital, two of those in intensive care. She lost over half of the hair on her head and has also had skin eruptions, many as big as a large coin, which leave permanent scars. Doctors were baffled by these symptoms but speculated that they were caused by some type of radiation, they just weren’t sure of the what, how and why of the situation. Nevertheless, Betty was moved into a HAZMAT room in the basement level of the hospital and visits to her were limited until doctors could assess whether she was a danger to others. But Betty, Vickie and Colby were not the only witnesses to the strange aerial activity that night. An off duty Dayton policeman and his wife were driving home from Cleveland, Texas through the Huffman area that same night and reportedly observed a large number of CH-47 helicopters. Furthermore, a man living in Crosby, directly under the flight path, reported seeing a large number of heavy military helicopters flying overhead as well. But it wasn’t just a fleet of helicopters that were seen that night. Oilfield worker Jerry McDonald was in his back garden in Dayton when he saw a huge UFO fly directly over his head. At first he thought it was the Goodyear blimp, but quickly realized it was something entirely different. “It was kind of diamond shaped and had two twin torches that were shooting brilliant blue flames out the back”, he said. As it passed about 150 feet above him he noted that it had two bright lights on the front of it “like headlights” and a red light in the center. Was this the same craft in question even though his details don’t exactly match Betty, Vickie and Colby’s description? Either way, we have multiple witnesses corroborating the trio’s testimony and this just further supports the fact that something extremely bizarre was going on in the skies above northeast Houston. So what exactly did everyone see? In early January of 1981, I was catching a ride from a buddy who lived in Conroe, Texas, and we necessarily traveled that same roadway (FM 1485) on our way to work on the east side of Houston. We usually left well before sunrise to reach our jobsite by 7:00 AM, as the commuter traffic up there around Conroe was legendarily bad. So it was still dark when we hit the road. This would have been shortly after the Cash-Landrum incident transpired, but we didn’t know that, as the story had not yet reached the press. Outside of New Caney, Texas, on a stretch of 1485 that was particularly desolate at the time, we encountered a nondescript sawhorse roadblock and what I supposed was a contract road crew working in the dark, using only a spotlight tree to illuminate what appeared to be some serious road repairs. In fact, we were turned back to New Caney because the entire road was closed. I thought this was odd because there were no “detour” nor “road closed” nor “men working” warning signs, and it was highly unusual for road repairs to shut down both sides of a thoroughfare. Unless, of course, it was an emergency job. We assumed that a petroleum tanker had crashed and burned, damaging the road and warranting a rush repair. By the light of our headlights, we could see quite a bit of heavy equipment — a couple of beaten-up and unmarked dump trucks, an unmarked front-end loader, an unmarked road grader, and a couple of other bulky vehicles hidden by the darkness. I guessed that it was a blacktop machine, because we could smell creosote and asphalt in the air. None of the road crew were wearing reflective gear, either, which I thought was pretty peculiar. They were tearing up and laying a new road. In the dark. Peculiar indeed. In fact, a History channel episode of UFO Hunters (“Alien Fallout”, 2008) focused on this section of roadway and even took a core sample which showed evidence of the pavement being entirely replaced. This is hard evidence of an event happening here that the military wanted to cover up completely. As far as I’m concerned, this is undeniable proof of their acknowledgement of this event! This single piece of evidence alone is enough to shut down any theories of this being an elaborate hoax perpetrated by Betty and Vickie. Yes, believe it or not there are still people who believe that these women somehow put themselves through this physical ordeal for some twisted financial gain. I suppose they hired a road crew to replace an entire section of highway in the middle of the night too? Given the women’s firm belief that the military was involved, they filed a lawsuit against the US government. This led to a taped interview held at the Bergstom Air Force Base Law Library on August 17th, 1981, between Betty Cash, Vicki Landrum, Colby Landrum and representatives of the United States Air Force, in particular Capt. John Camp. What followed was a detailed account from both women and Colby regarding the incident. You can read the entire transcript here but I just wanted to point out one exchange in particular which I think is very indicative of the USAF’s thinking regarding this incident. Capt. John Camp: OK, Ms. Landrum, what are your hopes or aspirations with coming and talking with us today? Vickie Landrum: … And what better place is it than a part of the government, because they’re supposed to protect us anyway, right? Because my husband went over there and fought for two and a half years… he got two purple hearts out of the deal, and if you’re not protected, what did he go over there for? Betty Cash: (agitated) Well now, what can we do?? John Schuessler received a call from Sarran on March 19, 1982, and provided complete cooperation and guidance. He was ultimately unable to trace the helicopters to any Army, National Guard, or Army Reserve unit. The implied scope of the hypothetical Army “exercise” during the normal year-end holiday season “stand-down” period would have required extraordinary logistical support, yet no record could be found that such an operation actually occurred. Furthermore, an investigation by Allan Hendry, who had a brief tenure with CUFOS working with Dr. Hynek, failed to determine the source of the helicopters; no civilian or military airport would admit to any knowledge of them. Legal attempts to get answers from government agencies ultimately met with failure because it could not be proven that the UFO or the helicopters were US government property. A judge finally dismissed the entire case in 1986 citing expert testimony that no such craft as the reported UFO existed in the military arsenal. Soon after this, the investigation into the case faded into the background. So what exactly was this craft and will we ever be able to answer that question? It is a known fact that Betty Cash was isolated to a basement level of the hospital where she was being treated for her injuries within a HAZMAT containment room. All doctors and nurses who were treating her were required to wear the proper hazardous materials protective garb. One of Betty’s close friends recounts thisoften overlooked fact in a History Channel documentary about the case. The experimental military craft theory was further supported when the UFO Hunters team met up with Dr. McClelland, Betty’s original physcian, in 2008 who said there were people “in the know” who had stepped forward and told him that there was an accident with an aircraft called the “W.A.S.P. 2”. A quick search shows that this was to be a follow-on to the US Army WASP 1 personal VTOL aircraft, which was nothing even remotely in the same ballpark as what Cash and Landrum witnessed. Sorry Dr. McClelland, but these people who were in the know aren’t even close to the truth of the matter. Could it have been an experimental nuclear-engine powered military craft? It’s certainly possible, the military was experimenting with nuclear powered aircraft and cruise missiles as early as the late 50’s including Project Timberwind which was aimed at developing nuclear thermal rockets. But all of this research was considered classified and tested exclusively on the Nellis Nuclear Test Range and White Sands missile range, nowhere near Texas. Testing anything that could be potential deadly to civilians due to radiation exhaust or leakage is strictly forbidden. Even flying a nuclear payload across the country in a military aircraft has strict procedures that must be followed. So that begs the question, maybe this was some sort accident that took place in a non-nuclear powered craft, one with some other exotic propulsion system, and this non-ionizing radiation was a byproduct of that malfunction? Possibly, but if it were a man made craft the engineers would have already known this was the case and treated it as any other potentially dangerous, radioactive system. Thus, it would have been nowhere near Houston, Texas. There is always the possibility that it truly was an alien craft, albeit a dangerous one, but an extraterrestrial craft nonetheless. Perhaps the Cash-Landrum trio was simply in the wrong place at the wrong time and suffered the unfortunate consequences of that encounter. But this isn’t the first time an eyewitness has suffered similar radiological effects from a close encounter of the second kind. Around noon on May 20, 1967, Stephen Michalak, an industrial mechanic from Winnipeg, was doing some amateur prospecting in the Falcon Lake area of Manitoba when he reportedly came into physical contact with a landed UFO. He would later state that he was examining a rock formation when two UFOs appeared before him. One of the UFOs remained airborne in the immediate area for a few moments, then flew off at great speed. The second UFO landed a few hundred feet away from his position. As he approached the UFO, a side door opened and voices were heard coming from within. Mr. Michalak states he approached the object but was unable to see inside due to a bright yellow bluish light which blocked his vision. He endeavored to communicate with the personnel inside the object [in English, Russian, German, Italian, French and Ukrainian], but without result. As he approached within a few feet of the object, the door closed. He heard a whining noise and the object commenced to rotate anti-clockwise and finally raised off the ground. He reached out with his left gloved hand and touched the object prior to its lifting off the ground; the glove burned immediately as he touched the object. As the object left the ground, the exhaust gases burned his cap, outer and inner garments, and he sustained rather severe stomach and chest burns. As a result of these he was hospitalized for a number of days. The doctors who attended and interviewed Mr. Michalak were unable to obtain any information which could account for the burns to his body. The personal items of clothing which were alleged to have been burnt by the UFO, were subjected to an extensive analysis at the RCMP Crime laboratory. The analysts were unable to reach any conclusion as to what may have caused the burn damage. The key take-away point from this case was the fact that his glove, outer clothing and inner garments were burned rather severely by the ‘exhaust gases’ of this craft and left him hospitalized with rather unusual burn marks. Again, here we have a case of a craft of unknown origin leaving an eyewitness with physical evidence of an encounter with something that was possibly giving off some type of radiation–13 years priorto the Cash-Landrum incident. A Malfunctioning Man-Made Probe From the Future? In line with the theory that some ‘aliens’ are actually humans from a future timeline that are popping back into our current reality, there has been speculation that this craft might have been ‘ours’ but not necessarily from now. 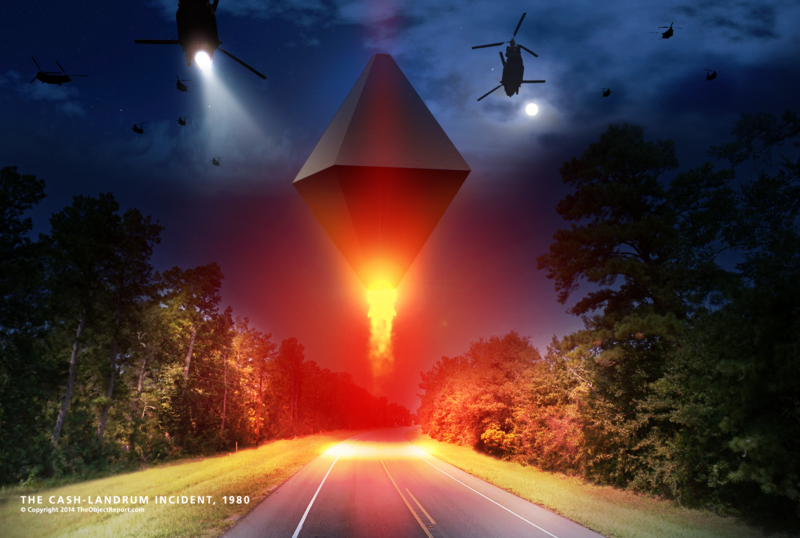 I realize this might seem far fetched, but not that much more far fetched than the military letting a radiation spewing diamond shaped craft loose over rural Houston, Texas in 1980. There is a distinct possibility that this object was transdimensional in origin and the helicopters were scrambled to intercept something that should not have been there at that time. It would make sense that this event came as a surprise to the military based upon the erratic flight patterns of the helicopters and, as the Cash-Landrum trio stated, “the helicopters seemed to try and encircle the object.” Clearly they didn’t want it to get away from them, whether that was because it was ‘ours’ or not is still up for debate. Unfortunately, the military has been (and continues to be) fascinated by the prospect of putting a nearly unlimited nuclear power source into ships, subs and aircraft. Westinghouse water-cooled nuclear reactors are now as small as a compact car, the Russians even put refrigerator-sized nuclear power plants on board military satellites in the late 60’s and early 70’s. So it would not surprise me if something like this was in fact our idea, but maybe not from our current timeline? Jim Penniston: They are asking me if I see binary code? I see the binary code. They are time travelers… They are us. Hypnotherapist: How far in the future? Jim Penniston: A long time. Very long time. Hypnotherapist: What do they need? Jim Penniston: Not sure, but it has to do with chromosomes? Or something like that. Hypnotherapist: How do they get that? Jim Penniston: They take it. I’ll delve further into this next, but I don’t think we can rule out this theory any more than we can eliminate any other theory, no matter how incredible it may seem. It is my personal opinion that the Cash-Landrum Incident is related to the events that transpired in the forest adjacent to Rendlesham AFB in England only the night before. How they are related remains to be seen, but the timing of these two events is of absolute importance. When you have two high-profile incidents like these which are backed by such hard evidence and they happen within the same 24-48 hour period, I think we’re forced to give the idea of there being a connection some serious consideration. The Rendlesham craft were described as giving off brilliant red light that was almost difficult to look at. One of the craft appeared to exude what looked like “dripping molten metal” along with an intermittent red flame. Intense heat and verifiable radiological after-effects were associated with both events. The Rendlesham & Cash-Landrum craft all shared design elements that included diamond and pyramid shapes. Perfect geometric shapes seem to be a common denominator among the vast majority of UFO’s, especially those associated with dimensional time travel. Was this fire and radiation-spewing metallic diamond in Texas connected to the Rendlesham forest incident? Was the military aware of both of these incidents and their connection to each other an ocean apart? The Cash-Landrum craft was dangerous and exhibited unpredictable behaviour, this could be evidence of AI and/or an RPV that has lost control. The helicopters sent to intercept it were in such numbers that we can conclude this was a non-typical event for the military. There should be a focus on obtaining FOI documentation related to spec-ops missions during that time frame. The incident was a logistical nightmare for the military and it’s quite surprising that nothing has bubbled up to the surface from those involved 34 years later. This shows the level of lockdown imposed on all of those that were associated with it. It most certainly was not the second coming of Jesus Christ. We may never uncover the truth of what this craft was, we just know that it used an unconventional propulsion system which had a long-lasting, negative physiological effect on the eyewitnesses and it forever changed their lives. There was a wealth of data collected over the course of the Cash-Landrum incident and it’s resulting fallout on those involved, perhaps there’s yet more to decipher from the event.